DublinBikes expansion into the Docklands and around Heuston Station is not a done deal. That’s despite a re-announcement from the government that the expansion is to get millions in funding. A spokesman for Dublin City Council welcomed the extra funding but confirmed that talks have not concluded with JCDecaux — the advertising company which runs the bike sharing scheme and owns the rights to the design of the bicycles and docking systems. “Dublin City Council welcomes the announcement of €2.6 million in NTA funding toward the cost of expanding the dublinbikes scheme. The council is currently negotiating details of the scheme’s expansion with JCDecaux and will announce further details of this when possible,” a council spokesman said. The National Transport Authority (NTA) has even said that a “parallel bike scheme” will have to be looked at if the talks fall through. The Department of Transport issued statements last week from both transport minister Leo Varadkar and junior minister for public transport Alan Kelly re-announced funding for the expansion. They confirming €2.6 million is ready to be spent on the scheme this year. “Dublin Bikes is one of the most successful cycling initiatives ever tried in this country and is one of the most successful schemes in the world. This success needs to be built on. We have had over five million journeys so far and many thousands of journeys are taken each day with over 90,000 subscribers,” said Kelly. The number of bicycles could nearly treble, from 550 to about 1,500 – although no firm details will be known until a deal is reached. In the longer term the city wants to expand the bike scheme from DCU to UCD. If a deal is reached, the NTA is ready to fund the short-term expansion with around €5 million over the next two years, the head of the authority told the Public Accounts Committee of the Houses of the Oireachtas. DublinBikes negotiations “will conclude one way or the other” within three months, Gerry Murphy, the chief executive of the NTA, said last month. “It’s a proprietary system so the extension of it will be through JCDecaux. Dublin City Council is negotiating with them about the extension,” Murphy said at the Public Accounts Committee. “There will be insufficient advertising revenue to support the extension and that’s why there needs to be a State intervention – which comes through funds we provide to Dublin City Council,” he said. 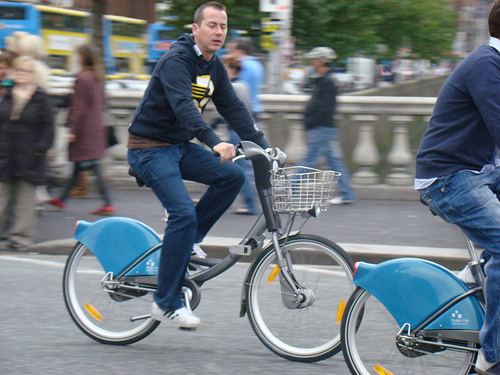 Murphy said the NTA has “aside €2.5 million for 2013” and another €2.5 million for 2014 for the expansion of Dublin Bikes. “We had set aside money last year and were disappointed [the talks] had not come to conclusion last year. We under stand it is going to come a conclusion in the next three months – they are going to agree to the extension of the scheme or they are not. “If they don’t agree to the extension of the scheme then we had to look at that scenario. We may have to look at a parallel bike scheme that we develop our self,” said Murphy. Cropped map showing the original area and short-term expansion areas 2A and 2B. From the council’s dublinbikes Strategic Planning Framework 2011 – 2016 report — click for full map.